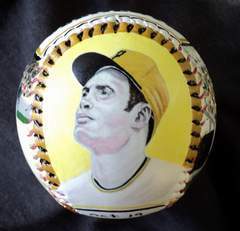 This Legends Hand Painted Roberto Clemente Baseball features four of my original paintings of the Great One. 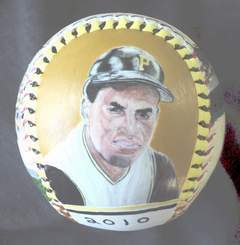 Side one is my close up painting of Roberto Clemente wearing his 1971 Pirates uniform. Click here for a closer look. Side two has my close up painting of Roberto wearing his 1960's Pirates uniform. Click here for a closer look. 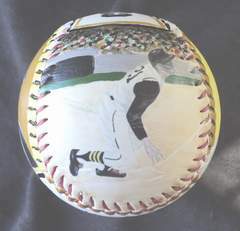 Side three shows my painting of Clemente getting a hit in the 1971 World Series. Click here for a closer look. 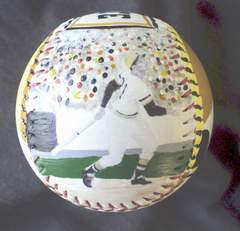 Side four is my painting of Roberto getting a hit in the 1960 World Series. Click here for a closer look. 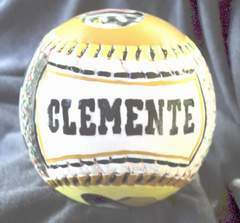 Side five, which is the top of the baseball, has CLEMENTE surrounded by Pirates colors..
& nbsp;Side six, which is the bottom of the baseball, has my signature along with the date that this Legends Hand Painted Baseball was completed and trimmed with Platinum. 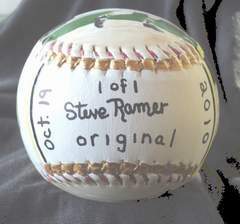 Also you will see "1 of 1". This means that this is number one of only one created. This is a one of a kind piece of art. There will never be another exactly like it.